Fly fishing brings insane joy. And frustration. Hence the fanatical nature of fly fishermen. In our Man Makes Fire guide to the best fly fishing gifts 2019, we choose some of the core gear most every fly fisherman needs, could use, or would appreciate. Some fly fishers already have some of this gear, but gear wears out, breaks down, and gets lost. Plus, some of these best gift ideas for fly fishing fanatics are for fly fishing gear that’s been improved with new features. Fly fishing brings insane joy. And frustration. Hence the fanatical nature of fly fishermen and women. Fortunately, you have lots of fly fishing gift idea options. The Measure Net. Even long-time fishers who already have a landing net might very much appreciate a net that lets them quickly note the length of their fish — and this is why the Measure Net leads our best gift ideas for fly fishing list. For some, learning to fly fish is a long-term process where you acquire new gear, try it out, and settle into the systems that work for your favorite streams, rivers, and lakes. For instance, for fishing close to a campground, a fly fisherman might go light with just a lanyard of core accessories and a fly box. But for an all-day outing on favorite river far from the road, waders with a cool new sling pack might be the smartest way to chase after the fish of a lifetime. Either way, these 15 best gift ideas for fly fishing fanatics will get you pointed in the right direction! Take your eyes off the trout and notice the Measure Net, one of our favorite all-around fly fishing gifts. The Measure Net is one of the most brilliant fly fishing inventions ever created. 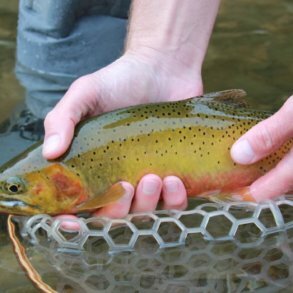 First, nets help fly fishers land fish more easily and release them unharmed. The Measure Net takes this a step farther by using a series of painted numbers inside the net to also measure the length of the fish. It works well and takes the guesswork out of length. 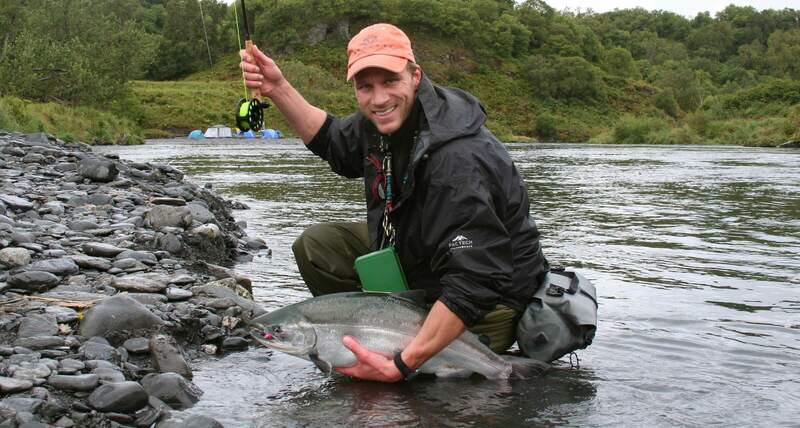 Obviously fly fishermen like to catch all sorts of fish, but bigger is better and the bragging rights are in the net. Of course, if your fly fisher is a chronic exaggerator who does not want to live in our reality, you can always sew up the bottom of the net to make all the fish appear a few inches longer. But seriously, the Measure Net is a fantastic fly fishing gift. 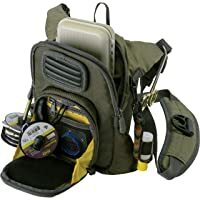 A fly fishing lanyard is basically a specialized necklace with attachment points for commonly used fly fishing accessories like clippers, tippet, floatant, and forceps. If your fly fisher doesn’t wear a vest or chest pack, the lanyard is a must-have accessory that works well with or without waders. Lanyards also pair particularly well with waist or lumbar packs. But wait, there’s more: Lanyards are great fly fishing gifts for kids and newbies, but they’re handy for experienced fly fishers, too. We like to attach a small fly box to ours, which gives us everything we need for quick jaunts down to the river or around base camp. The chest pack has been replacing old-school vests for a lot of fly fishermen. Why? They focus what you need right under your nose, giving you great access even when you’re wearing a pair of waders and are standing in waist-deep water. A new variation on the chest pack is a “sling pack,” which is lets you carry your gear on your back, but when you need it, spin it around to your front for easy access. The zippers and orientation are designed to work when pulled in front of you. The key benefit? You can carry more gear than a typical chest pack allows. A good sling pack is a splurge kind of item, so they make great fly fishing gifts. For those rivers that are bordered by roads, it’s nice to be able to stow your fly rod on your vehicle and then drive up the river to a new spot. When you get out, boom, your long and ungainly fly rod is ready to rock and roll. Some guys will simply prop their fly rods on their windshield underneath their wiper blades, but it’s not the most secure method. And it can result in vibration and scratches to the rod or your pickup. A better solution is a dedicated rod mount system that uses suction cups or magnets to lift your rods above the hood of your vehicle and secure them in place. Quite handy and it makes a great fly fishing gift. 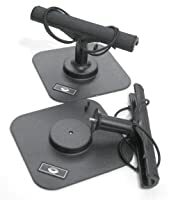 Oh, one more thing: It’s hard to beat the price-to-value ratio of the Vac Rac Combi magnetic version, but if your fly fisher has one of the newer aluminum body pickup styles (non-magnetic) be sure to go with the excellent Sumo Car-Top Rod Rack suction-cup version. 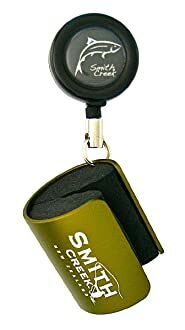 The Smith Creek Rig Keeper is an ingenious little fly fishing accessory that lets your fly fisher save dropper rigs. What the heck does that mean? Fly fishers will often tie two flies on the end of their line, a lead fly and a dropper fly, which is often tied to the bend of the hook on the lead fly. For example, a grasshopper pattern could be the lead fly and then an ant pattern could be the dropper fly. The big grasshopper pattern can attract a trout’s attention while the ant pattern can trigger a strike. But then your fisher will need to change flies . . . but will also want to keep the hopper-ant rig connected to use again later. 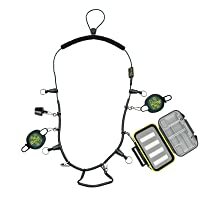 The Smith Creek Rig Keeper lets your fly fisher wrap dropper rigs around the foam core and connect them to their vest, sling pack, fishing backpack, or lumbar pack. It’s super handy and works well. If your fly fisher fishes for trout in freshwater rivers and streams, the Smith Creek Rig Keeper is one of our favorite fly fishing stocking stuffers for 2019. 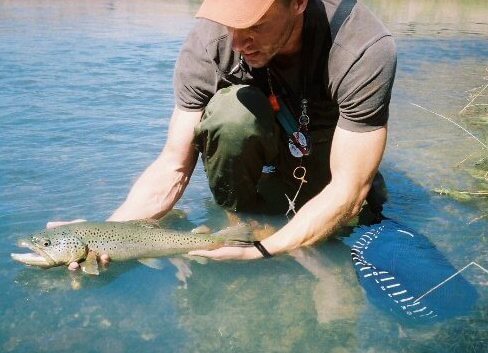 Most fly rods are about 9 feet long because it’s a versatile length. The handiest rods we go for are those that break down into 4 pieces, which makes them easy to pack and travel with (they fit into go bags, too). While some premium rods ship with their own protective rod cases, few also include a built-in spot for a reel. If you have a case with this spot for a reel, you can pack your rod and reel together. It saves a bit of time, and when a fly fisher hits the river, it’s hard to be patient. Plus, if your fly fisherman doesn’t have a good case at all — but has a four-piece rod — this is a fly fishing gift that will get used and appreciated (they also come in versions for two-piece rods). The GoPro action sports camera system is the most widely used waterproof video camera in the world. For a fly fisher with a chest mount, the GoPro can capture first-person action of a fighting fish, and when it’s time to send the fish back home, they can dunk the GoPro underwater to record one of those cool underwater release shots. Even professional fishing show hosts are using GoPro cameras for this purpose. We don’t understand the physics of light, but we know something about glare, and when you’re on the water, certain angles of sunshine create glare on the surface of water, making it hard to see beneath. Polarized sunglasses cut this glare the best, letting a fly fisher spot fish beneath the surface, which often makes for some of the best fly fishing experiences. If your fly fishing fanatic hasn’t splurged on a pair polarized sunglasses yet, that’s your cue pick these as your next fly fishing gift. We particularly like the price-to-value ratio on the sweet and sharp-looking new Orvis Superlight Tailout sunglasses. 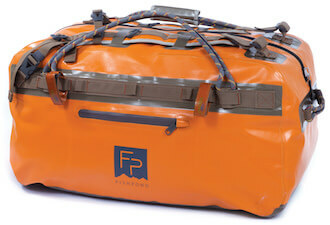 The Fishpond Thunderhead Submersible Duffel is also a backpack. It’s a beautiful bag, functional and tough. One of the things that works against fly fishermen (and women!) getting out of the house is preparation — are you ready to go at a moment’s notice or do you need to put everything together? Go bags solve this problem. We like to throw most of our fly fishing gear into a single large expedition duffle bag that will hold 4-piece rods, wading boots, waders, a net, fly boxes, reels, fishing regulations, a first-aid kit (always a good gift, by the way), and more. When you get a chance to hit the river, all you have to do is grab your bag and leave with confidence that you have all the core gear you need. Go bags are nearly life transforming tools, and as such, they turn into fly fishing gifts that last years. Oh baby, pontoon boats are super cool. They break down and pack up small so you don’t have to own a pickup or a trailer to use one. Plus, single fly fishers can run them by themselves, even through some decent rapids. Better still, some are large enough for two people. And . . . quite simply, there are some rivers where you just can’t get to the biggest fish without using some sort of water craft. If your fly fisher unwraps a pontoon boat as a gift, look for the broad smile as the fanatic brain furiously churns through rivers and lakes that are suddenly open to new casts. The Magnetic Net Release lets a fly fisher attach their net to the back of their vest to keep it out of the way while fly fishing, but once they need it, it pops off for easy access and use. Brilliant. Works great as a fly fishing gift stocking stuffer, too. It’s still a fairly recent invention, so there are plenty of fly fishing fanatics out there who don’t have one yet. A good pair of wading boots makes fly fishing easier and safer — they provide support and traction, and they tend to hold up well under water by not losing their shape over time. 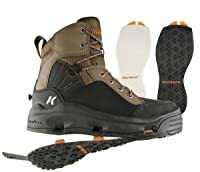 Typically, wading boots are used with a pair of stocking foot waders so they are sized a bit large because the stocking (neoprene) foot of the waders takes up space. But wading boots are also great for hot-weather summertime fishing. In this case, a set of neoprene booties are the way to go. Get wading boots when your fly fisher has none or a really old pair. They also go great with a set of waders (the next best fly fishing gift, noted below). See also, 10 Best Wading Boots, which includes a section on wading boots for women fly fishers. 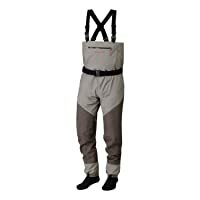 Stockingfoot waders tend to be more versatile than waders with boots connected to the ends of them. Why? The waders can fail and you don’t lose your boot investment. Also, separate boots tend to fit better and provide better support. So we’re fans of stockingfoot waders. Waders are like most other pieces of gear. More expensive sets will be more durable and last longer . . . but these days an entry-level pair will usually get the job done for a few years of use, no problem. Check out our guide to the 10 Best Fly Fishing Waders for more detail on this game-changing fly fishing gift idea — especially if you want to surprise your fly fisher with some high-end Patagonia or Simms waders. We had no idea that a few simple adjustments to the standard fly fishing forcep design could result in such an improvement — the new Loon Outdoors Rogue Quickdraw Forceps is truly a fantastic take on one of the most popular fly fishing accessories today. Forceps are sometimes called hemostats and they’re basically a fancy set of pliers that let fly fishers remove hooks from the jaws of fish and bend down barbs to meet barbless fishing regulations. Some forceps include handy scissors (like this new Loon Rogue model) and some include fishhook eye-clearing needles (also like in the Rogue). The Rogue includes oversized, rubberized finger hole handles . . . and then takes this design to whole new level by adding a carabiner-like clip built into the handle. Sure, a lot of fly fishers use retractable zingers to hold their forceps, but this little clip gives you a whole new world of attachment points to use. So cool, so handy. If you’re looking for a gift for a fly fisherman who has everything — or a fisherwoman, of course — these Loon Outdoors Rogue Quickdraw Forceps will make a great gift for pretty much every freshwater fly fishing fanatic. One more thing: These are so good that Orvis now has an Orvis-branded version. Highly recommended. 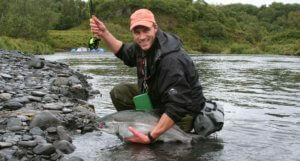 Not all fly fishermen are complete fly fishing snobs . . . some just like to get out on the water any chance they can get and they’ll happily use a spin fishing outfit in order to cast a line and catch a fish. 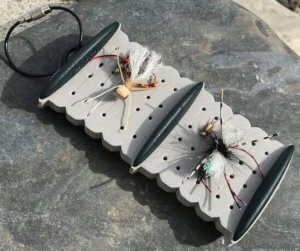 For these sorts of guys, one of the best gift ideas for fly fishing is, ironically, an easily packable spin-fly combo. Of course, you should know that a spin/fly combo doesn’t result in a fantastic fly rod, nor does it result in a fantastic spinning rod . . . but it will catch fish. As every fly fisherman knows, having any rod while you’re looking at fish swim in front of you is better than having no rod at all. 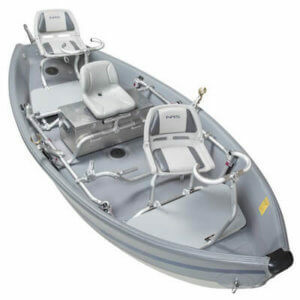 Bonus: NRS Freestone Drifter Inflatable Boat! If you really want to go over the top, pick up an NRS Freestone Drifter Inflatable Boat. 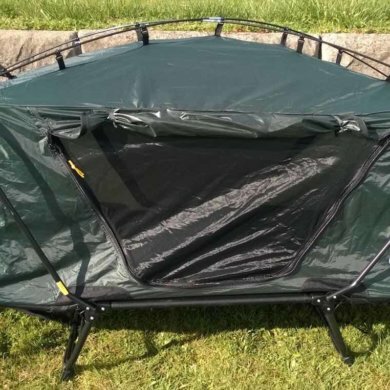 This inflatable drift boat is particularly great for a fly fisher who doesn’t have the storage space for a traditional hard-wall drift boat and trailer. You can fit this into the back of a pickup and assemble it in places that don’t have traditional boat ramps or launching points for traditional drift boats. The total weight is just 310 pounds. Sure, it’s pretty specialized, but if your fly fisher might enjoy to floating a few rivers and getting off the beaten path, the NRS Freestone Drifter might be the answer. Need More Fly Fishing Gifts? 16 More Fly Fishing Gifts for Fly Fisher Fanatics! How About Fly Fishing Stocking Stuffers? The Smith Creek Rod Clip lets you use two hands to release a fish or tie on a fly. So cool.